You are the hacker now, not your character. Gain access to any terminal with the first hacking perk and use all your wits in much harder minigames. Base number of attempts is reduced to 3, and any subsequent hacker perk gives you an additional one. If you fail, then deal with consequences of much longer lockdown. You are free to use this mod anywhere, no permission is required. This mod changes 4 hacking perks to emphasize the payer's skill rather than your character's one. 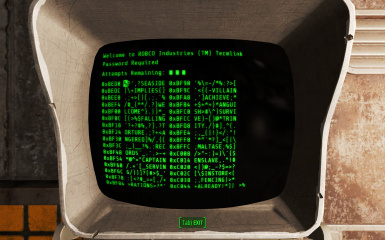 In old Fallout games only character skill was involved in hacking - you only had to get enough character skill to hack something. Bethesda decided to add minigames based purely on player skill - when your character has enough skill/perk to hack, then you, the player, now need to win in a minigame. Some people don't like it and prefer character skill based approach without minigames. Others find it interesting but too easy, and the perks spent on hacking don't actually help you at all in minigames, feels like a waste. If you are from the first group, there is Easy Hacking mod to bypass minigames. Player hacking is intended for the second group of people, who want harder minigames with purely player skill based approach where hacking perks affect the minigame itself and character skill doesn't matter at all. Knowledge of cutting-edge computer encryption allows you to hack any terminal but only with 3 attempts and much longer lockout time. You instantly have access to terminals of any complexity, but with reduced number of attempts. Moreover the number of passwords is increased to make it miserable with only a single hacking perk invested. If you fail, the lockout is 5 minutes now instead of 10 seconds. You gain additional hacking attempt. If you are really good in hacking minigames, you can hack any terminal even with only a single perk right at the start of the game, it all depends on you now. Getting more hacking perks would make minigames easier, decide yourself how many extra attempts you need to win. The game no longer forces you to invest into hacking. Just be prepared that hacking a terminal with 3 base attempts and 20 passwords on a screen is not so trivial as before. If these are in the same line they can reset your tries or remove wrong answers. Mod was made by request. I'm personally from the first group and prefer character based hacking. This is a pre-CK plugin based mod, use at your own risk.